Claude Arpi: Chinese troops intrude in Ladakh: a coincidence? Xinhua has just reported that General Zhang Yang, a former member of the Central Military Commission’s (CMC) and the boss of the CMC’s Political Work Department, committed suicide last week. The South China Morning Post said that a source close to the former Guangzhou Military Command confirmed that Zhang hanged himself at his home in Beijing on the morning of November 23: “the news of his death had been relayed to all People’s Liberation Army theatre commands." Later Xinhua confirmed the circumstances of his death. Zhang was apparently linked to former disgraced CMC vice-chairmen Guo Boxiong and Xu Caihou who have been sentence for “serious disciplinary violations” in other words, corruption. [about] the rest of the 11-member Central Military Commission, Gen Fang Fenghui, Li's predecessor as head of the Joint Staff Department, and General Political Department chief Gen Zhang Yang were reportedly arrested in late August on suspicion of ‘disciplinary violations’. The allegations are believed to involve graft, though details have not been disclosed. Though such arrests are extremely unusual, the two officers are not the only Central Military Commission members ensnared in Xi's anti-corruption campaign. Guo Boxiong and Xu Caihou, both loyal to former President Jiang Zemin, were previously ousted over bribery allegations. Fang and Zhang reportedly had close ties to Guo and Xu, respectively. Reuters asserted that during his monthly news briefing, Defence Ministry spokesman Ren Guoqiang declined to comment on Fang, who turns 67 next year, usually around the age at which Chinese officials retire. It is getting hot in Beijing. I re-post here a piece posted in September 2015 about Gen Zhang Yang on the Indian border. Just the day before the new stand-off between the Indian and Chinese defence forces in Ladakh started, a senior member of the Chinese Central Military Commission visited the region. As it already happened before the visit of Premier Li Keqiang to India in April/May 2013 and also as President Xi Jinping arrived in Ahmedabad in September 2014, the Chinese People’s Liberation Army (PLA) intruded on India’s territory. The face-off is currently happening in Burtse area, a few miles east of Daulat Beg Oldie (DBO), where the 2013 confrontation occurred. The Indo-Tibetan Border Police apparently objected to the construction of the structure and, with the help of the Army, stopped the PLA. Subsequently, the PLA called for reinforcements, followed by a massing of more Indian forces in the area. 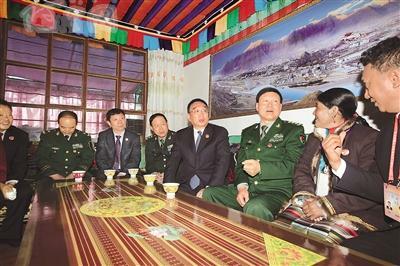 On September 9 and 10, a member of the all-powerful Central Military Commission visited Ngari Prefecture, which borders Ladakh, in Western Tibet. 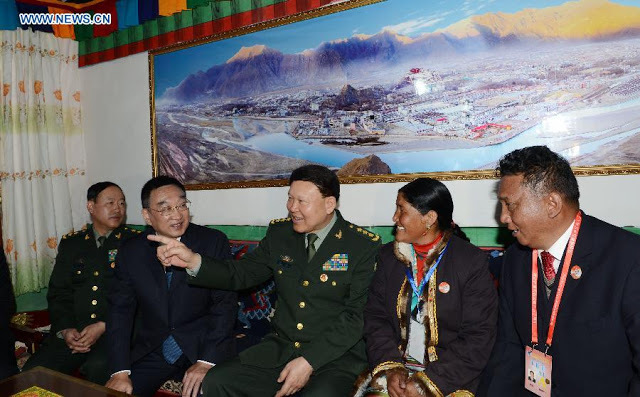 General Zhang Yang was in Tibet to ‘celebrate’ the 50th anniversary of the creation of the Tibetan Autonomous Region. At the end of the main function held in Lhasa, the ‘Central’ delegation divided itself into different groups. As mentioned in a previous post, Yu Zhengsheng went to Shigatse and visited the Tashilhunpo. Vice-Premier Liu Yandong went to Shannan (Lhoka) Prefecture, while Jampa Phuntsok ‘inspected’ Nagchu. Another ‘sub-delegation’ led by Du Qinglin, Vice-chairman of the CPPCC, went to Nyingchi. 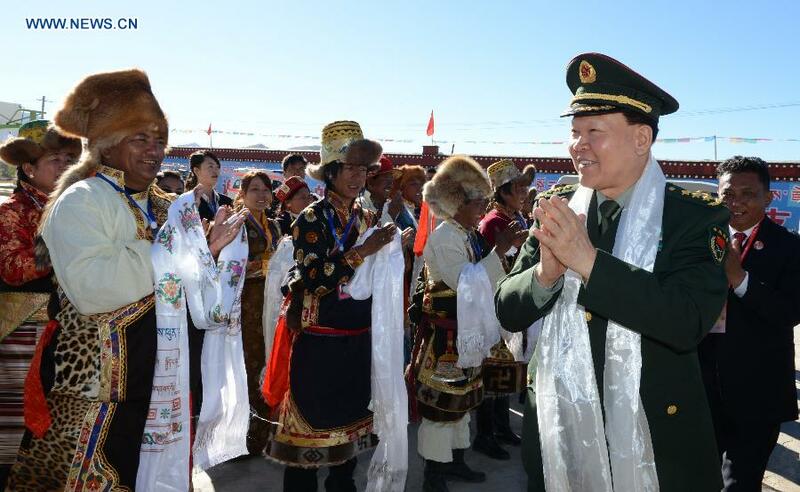 General Zhang Yang headed for a two-day tour of Ngari Prefecture. He went to convey the ‘loving care’ and the ‘deep feeling’ of the CPC Central Committee, the State Council, and the Military Commission to the ‘cadres and masses of all nationalities’. Note that ‘of all nationalities’, just means ‘Tibetans’. Like his colleagues, General Zhang brought along a banner carrying President Xi’s words, ‘Strengthen National Unity and Construct a Beautiful Tibet’. 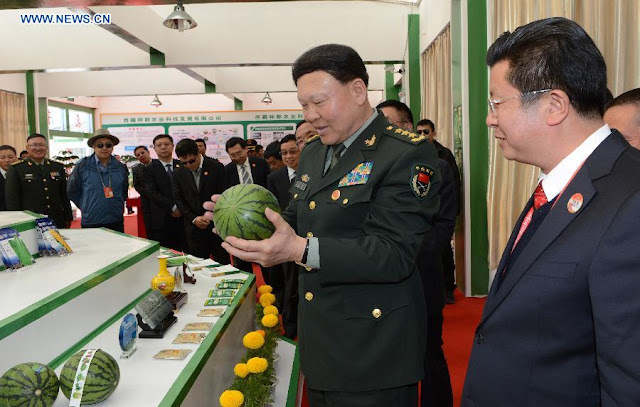 Zhang was accompanied by Lt. Gen. Xu Yong, commander of the Tibet Military District. What does General Xu refer to, when he speaks of ‘bloody battles’? It is not clear. The 1962 conflict with India? Also in the delegation, was Wang Yongjun of the Central Commission for Discipline Inspection (CCDI). A year ago, WantChinaTimes had reported that the CCDI’s boss, Wang Qishan had started ‘parachuting’ CCDI officials into key posts around China in order to strengthen the party's anti-graft campaign and bring new blood to certain regions. In January, 2014, Wang Yongjun, formerly deputy dean of the China Discipline Inspection and Supervision Institute was transferred to head the Tibet regional branch of the dreaded (by the corrupts) CCDI. The Political Commissar of the Tibet Armed Police Corps, Xiao Tang was also in attendance in Ngari. This is the usual stuff. And perhaps more importantly, one line in the local press mentions that Zhang 'visited the troops'. Was the 'political' general informed that the PLA was planning to build a structure in an area considered by India to be within her territory? If Zhang was not informed, the PLA has a serious problem of command. If he was informed, it is a serious issue for India. PS: By the way, where was Lt. Gen. Peng Yong, the commander of the Xinjiang Military District, who looks after Ngari area? Can a Yong (Xu) replace a Yong (Peng)?